IDC organizes a wide range of events designed to create an ongoing dialog about the effective use of information and communication technology in modern businesses, the latest trends and key issues, and the changing economic, social, and regulatory environments affecting both the sale and use of ICT. Bringing together users, analysts, vendors, business and professional associations, academics, government officials, and the press, IDC events focus on how technology helps enterprises and individuals succeed in the emerging markets of Central and Eastern Europe, the Middle East, and Africa. With locally based analysts in country offices across the region supported by regional hubs in London, Prague, Moscow, and Dubai, IDC is able to create truly excellent events based on extensive expert knowledge of ICT markets throughout the region. 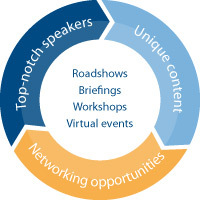 Each event features world-class speakers recruited from various sectors of the economy, including technology leaders, business innovators, and IDC analysts able to deliver unbiased insight into trends and challenges and into the solutions available to ICT management. IDC events in EMEA attract thousands of senior ICT decision makers annually. These movers and shakers of regional markets come to network and to discuss ICT issues with their peers, IDC analysts, and renowned business and technology leaders.